Directed by Academy Award® Winner Ross Kauffman and Emmy Award® Nominee Katy Chevigny, E-TEAM follows the high-stakes work of four fiercely intrepid human rights investigators who are the first on the ground in war torn countries like Syria and Libya to record and expose human rights violations in the midst of devastating wars. Anna, Ole, Fred and Peter are four members of the Emergencies Team – or E-Team – a division of a respected, international human rights group, that arrives on the ground soon after allegations of human rights abuse surface to uncover crucial evidence to determine if further investigation is warranted, and if so, to investigate, document, and capture the world’s attention. They also immediately challenge the responsible decision makers, holding them accountable. 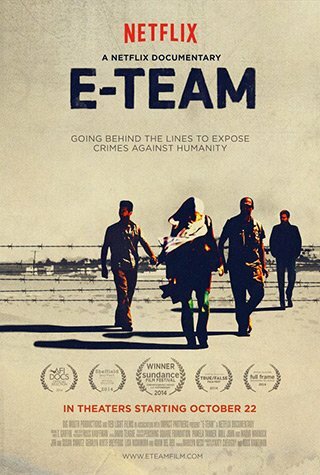 Human rights abuses thrive on secrecy and silence, and the work of the E-Team, backed by their international human rights organization, has shone a light in dark places and given voice to thousands whose stories would never otherwise have been told. Using a cinema verite approach, our camera follows the E-Team investigators in the field as they piece together the actual events that take place in various troubled spots around the globe. Together we smuggle across the border into Syria to conduct undercover investigations as the civil war rages; and amidst bullets and bombs, we watch as Fred and Peter work in Libya to halt human rights abuses in the aftermath of the Gaddafi regime. We also spend time with each E-Team member at home – from a quiet farm outside of Geneva to bustling urban lives in Berlin and Paris – as they balance the intricacies of family and personal relationships within the challenges of their exceptional work life. While from different backgrounds, Anna, Ole, Fred and Peter share a fearless spirit and a deep commitment to exposing and halting human rights abuses all over the world.